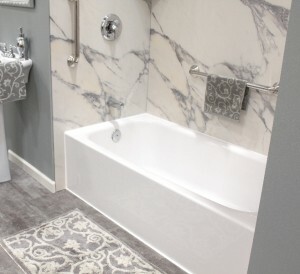 Need to Remodel a Bathroom in Des Moines, Iowa? U.S. Patio Systems and Home Remodeling has a well-earned reputation for providing its customers great value for their money. In addition to having a team of veteran installers, we utilize bathroom remodel products only from trusted manufacturers. For example, we use acrylic replacement tubs and acrylic replacement showers from Bathwraps, custom shower bases (pans) from The Onyx Collection, and walk-in tubs from The Safe Step Walk in Tub Co., which is one of the premier walk-in tub manufacturers in North America. If you would like to request more information about our bathroom remodel services, please contact U.S. Patio Systems and Home Remodeling today. We proudly serve Des Moines, Iowa, and other Midwest cities. As an official TEMO dealer, we also specialize in installing sunrooms, screen porches, pergolas, and patio covers. U.S. Patio Systems and Home Remodeling is also a basement finishing contractor, one that can turn an unfinished, underutilized basement into livable square footage. Our company is accredited by the Better Business Bureau (BBB) and is open for business seven days a week for our customers’ convenience.